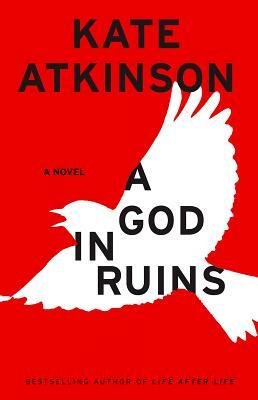 A God in Ruins is a book of the Todd Family by award-winning British author, Kate Atkinson. Teddy Todd: younger brother of Ursula, favourite son of Sylvie, model for his Aunt Izzie’s best-selling books, the young man whose life was cut short when he was shot down over Germany in 1944. Or not. During that dreadful war, Teddy never thought about the future: as a bomber pilot flying missions over Germany, he didn’t expect to have one. When he came home as an ex-POW in 1945, a hero, he suddenly, quite unexpectedly, did have a future in front of him. A career (not in his father’s bank, please! ), a wife, fatherhood, grandchildren: all were ahead of him in the latter half of the twentieth century. Teddy’s war experience plays a large part in the novel, as it does in his life. But Teddy is not the only narrator of his tale: his parents, his siblings, his spouse, his child and his grandchildren all add to the story of Teddy’s unexpected life from their own perspective. Once again Atkinson gives the reader a set of wholly believable characters, flawed but nonetheless appealing, and their reactions to the challenges life throws at them are natural and credible. And perhaps even the nasty ones have their reasons. There is plenty of humour to counter the lump-in-the-throat moments, and the irony of Ursula’s opinion on reincarnation is quite delicious. And again, Atkinson’s extensive research is apparent in every chapter. A God in Ruins is a companion volume to Atkinson’s earlier Todd Family book and, while it is not necessary to have read Life After Life before reading A God in Ruins, there are so many common characters, events and objects that the reader who has done so will be delighted to once again encounter old friends. Another brilliant Atkinson novel! Recommended.